Easy Homemade Chili Mac and Cheese loaded with beans is the ultimate casserole, ready and on the table in less than 30 minutes! A pasta recipe with a KICK of spice and incredible flavours that the whole family will go crazy for! Great for using up leftover chili OR make straight from scratch! Two comfort foods combine together in one pan for the best thing you’ll ever eat in your life — well apart from this Tuscan Chicken Mac and Cheese. This one is on a whole other level of greatness. 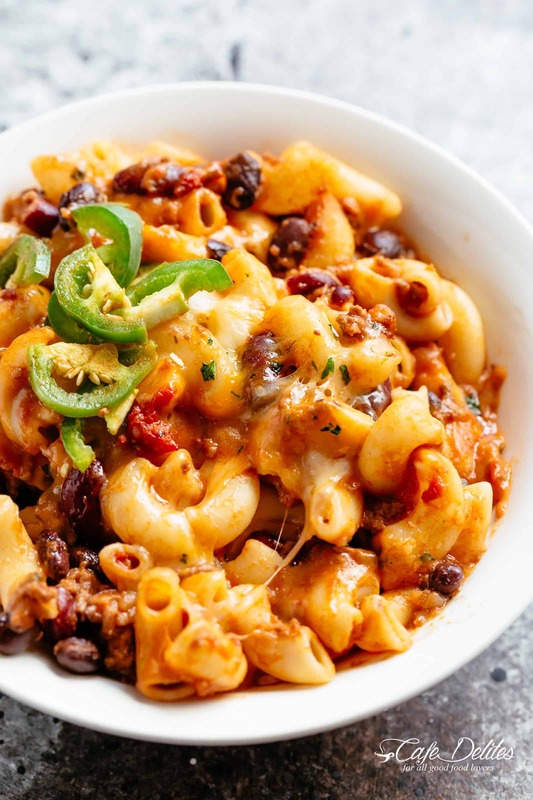 With many one pot Mac and cheese recipes on the inter-webs, this recipe is different in that you have the option of using leftover chili (something like this Chili recipe, for example), OR make an incredibly tasty chili from scratch! 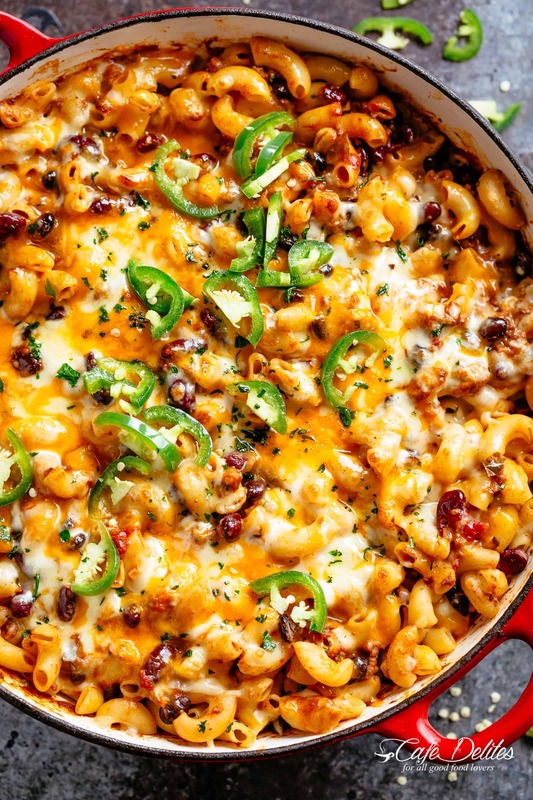 This Chili Mac is RICH with favour! There’s so much of it in this casserole we found ourselves eating it straight out of the pan! Plates are way overrated with something like this. Ground beef — I use lean beef in this. You can also use ground chicken or turkey. Beans — Both red kidney beans and black beans, but you can substitute with any you like. Tomato based ingredients for the best Chili sauce — crushed tomatoes AND tomato puree (aka Passata in Australia). I also add in tomato paste in this recipe to get the thickness and richness happening faster without having to wait hours! The ingredients list may look a little long BUT you can’t have a really good flavoured Chili and skimp out on seasonings! I used a mixture of American cheddar and mozzarella in this recipe just for the flavour and texture of those, but you can use Monterey Jack or a Mexican blend. You could also use Provolone or any other cheese you love! 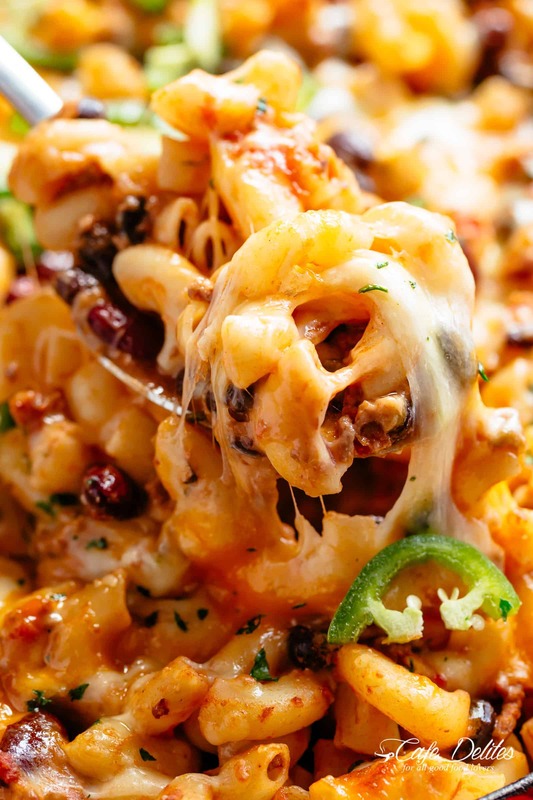 Once you’ve mixed your cooked pasta together with your chili, broil (or grill) the cheese topping for a couple of minutes to get it bubbly and melted! Garnish with some jalapeno slices and chopped cilantro, and ENJOY! 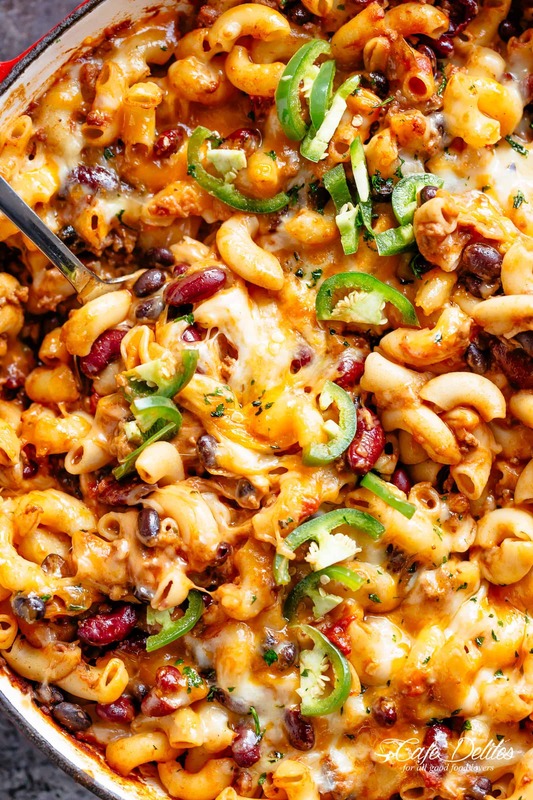 Chili Mac and Cheese with beans is the ultimate mash up of TWO favourites -- Chili PLUS Mac and Cheese! Using leftover chili OR chili made from scratch, this casserole is ready and on the table in less than 30 minutes! Incredible flavours that the whole family will go crazy for! Heat oil in large heavy-based pot (or casserole pot) over medium-high heat. Add onions and sauté until transparent, then add the green peppers (or capsicum) and garlic, sautéing for a further minute until the garlic is fragrant. Add beef and cook until browned, breaking up any big chunks with the end of your wooden spoon. Stir in the cumin, chili powder, paprika and salt and mix through until beef is fully coated in the seasonings. Mix in the crushed tomatoes along with the juices, tomato puree, broth, tomato paste and beans. Bring to a boil, then lower heat and allow to simmer while stirring occasionally, until the chili thickens (about 10 minutes). Preheat oven broiler (or grill) on medium heat. Add the cooked pasta and toss well to combine. Top with cheese, transfer to oven and broil for 2 minutes, or until cheese is bubbling and melted. Garnish with sliced jalapeños and chopped cilantro (optional). *The chili can be made up to 2 days ahead using this recipe (you will only need half of the recipe). After cooking, allow to cool completely, cover and refrigerate. 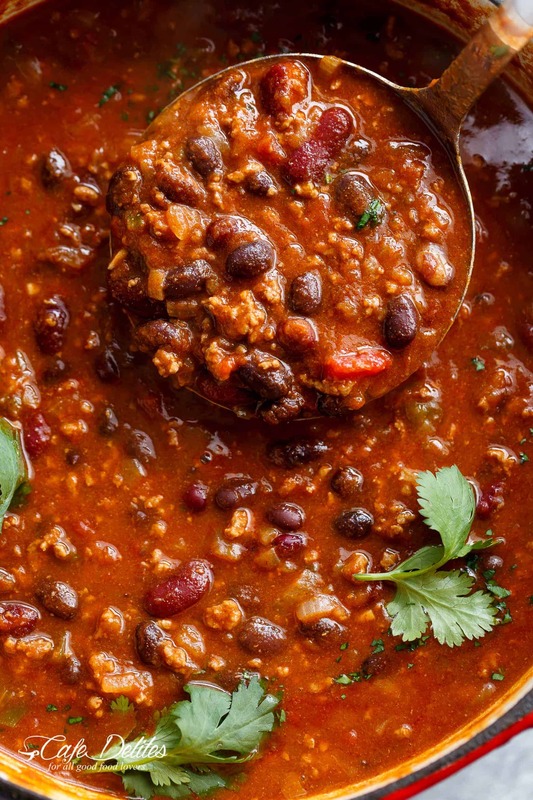 **If using leftover chili, you will need 4 cups of cooked chili! Mix it through the cooked pasta, top with cheese and ENJOY! 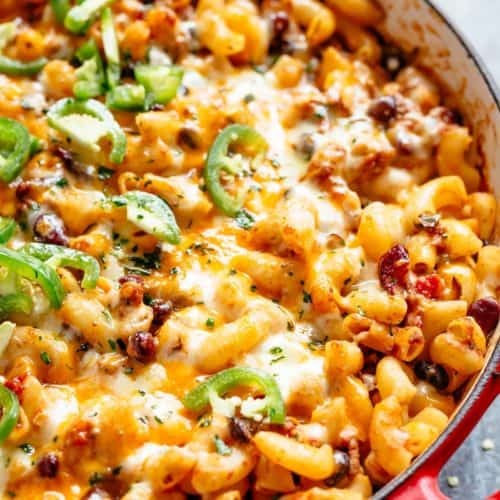 Definitely my new favorite chili mac recipe! I made a couple of changes but only in quantities. I’m in the US and used full 14 oz cans of beans, 14 oz diced tomatoes instead of purée (couldn’t find a small enough can), 14 oz can of crushed tomatoes and extra beef broth because I added the uncooked pasta with the beans to save a bit of time and let it cook in the same pot. Left the other ingredients the same and it was sooo yummy! This was delicious! The whole family scarfed it down lol..made it exact, wouldn’t change a thing! Thanks! I made this tonight for dinner and It’s really good and super easy to make! I’m not sure what I was thinking, but I added an entire tablespoon of cayenne and it was a bit too hot for me. I was able to reduce the heat by adding some more broth and tomato sauce, along with a couple pinches of sugar. I’ll use a combination of chili and cayenne next time. Pretty damn good, only thing I would add next time is a small drained can of corn and a diced jalapeno. Give a little something extra. That is great to hear! Thank you so much! Very easy to make (my chili is super simple). 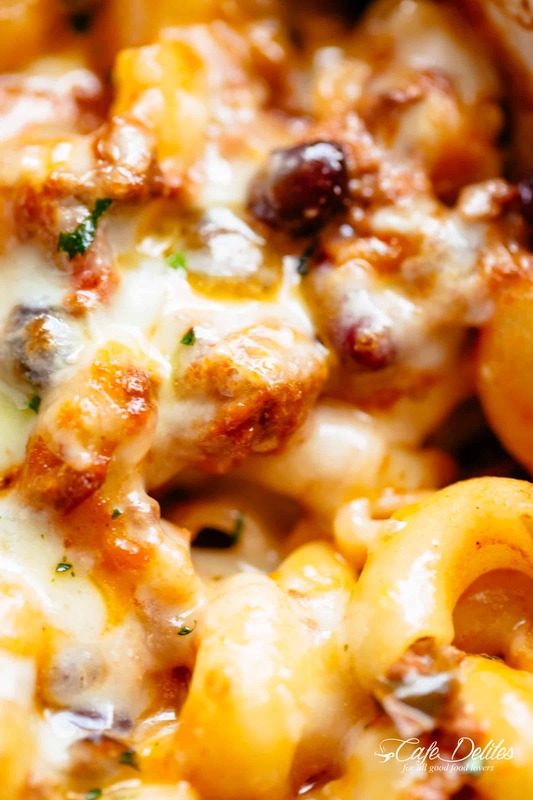 Who knew pasta and lots of cheese would be such a yummy transformation to chili. I’ll be making this again!